I bought this paper to make some pages of our nephew when he was born, and can't for the life of me figure out what company it is. Pretty sure I bought it at Michaels, and I searched the internet for the name, but alas I came up short. The colors really look good together, so I chose a dark brown to mat it in, as well as the saying. 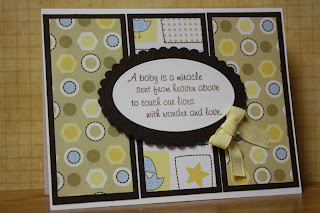 The saying is from the My Sentiments Exactly (MSE) set Sweet Thing. Have a great Family Day Long Weekend!